If you have a surrogacy story, or any other story you’d like to share, get in touch today. We’ll help you tell your story, and get paid the maximum fee possible. Help others in a similar situation. Raise awareness for a cause or a charity. The SellUsYourStory.com team helped Katy-Ann share her heartwarming surrogacy story. We arranged an exclusive deal with the Daily Record, who offered the most for the rights to publish their amazing story. This is the incredible moment one of Britain’s youngest surrogate mums made a couple’s dreams come true – when she placed their newborn baby in their arms. Katy-Anne McGlade had been facing up to a lifetime without the child she and husband John longed for. That chance seemed gone forever after the teacher had a hysterectomy in 2010 as part of treatment for cervical cancer. 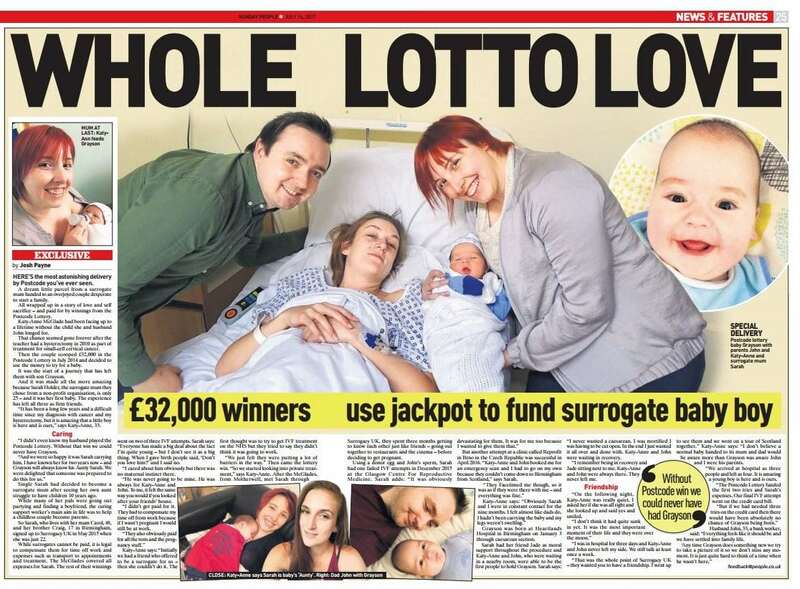 Then the couple scooped £32,000 in the Postcode Lottery in July 2014 and decided to use the money to try for a baby. It was the start of a journey that has left them with son Grayson – and made all the more amazing because Sarah Holder, the surrogate mum they chose from an online agency, is only 25 and it was her first baby. The experience has left all three as firm friends. “It has been a long few years and a difficult time since my diagnosis with cancer and my hysterectomy, but it is amazing that a little boy is here and is ours,” says Katy-Anne, 33. Single Sarah had decided to become a surrogate mum after seeing her own aunt struggle to have children six years ago. While many of her pals were going out partying and finding a boyfriend, the caring support worker’s main aim in life was to help a childless couple become parents. So Sarah, who lives with her mum Carol, 48, and her brother Craig, 17 in Birmingham, signed up to Surrogacy UK in May 2015 when she was just 22. While surrogates cannot be paid, it is legal to compensate them for time off work and expenses such as transport to appointments and treatment. The McGlades paid Sarah and the rest of their winnings went on two of three IVF attempts. Sarah says: “Everyone has made a big deal about the fact I’m quite young – but I don’t see it as a big thing. “When I gave birth people said ‘don’t you love him’ and I said no. “I cared about him obviously but there was no maternal instinct there. He was never going to be mine. Katy-Anne says: “Initially we had a friend who offered to be a surrogate for us – then she couldn’t do it. “The first thought was to try and get treatment on the NHS but they tried to say they didn’t think it was going to work. “We just felt they were putting a lot of barriers in the way.” Then came the lottery win. “So we started looking into private treatment,” says Katy-Anne. After the McGlades, from Motherwell, met Sarah through Surrogacy UK, they spent three months getting to know each other just like friends – going out together to restaurants and the cinema – before deciding to get pregnant. Using a donor egg and John’s sperm via IVF, Sarah had two failed attempts in December 2015 at the Glasgow Centre For Reproductive Medicine. Sarah adds: “It was obviously devastating for them. It was for me too because I wanted to give them that.” But a third attempt at a clinic called Reprofit in Brno in the Czech Republic was successful in April 2016. “Katy-Anne and John booked me for a scan and I had to go on my own because they couldn’t come down to Birmingham from Scotland,” says Sarah. Grayson was born at Heartlands Hospital in Birmingham on January 3 through caesarean section. Sarah had her friend Jade as moral support throughout the procedure and Katy-Anne and John, who were waiting in a nearby room, were able to be the first people to hold Grayson. Sarah says: “I never wanted a caesarean. I was mortified I was having to be cut open. In the end I just wanted it all over and done with. Katy-Anne and John were waiting in recovery. “I remember being in recovery and Jade sitting next to me. Katy-Anne and John were always there. They never left me. “On the following night, Katy-Anne was really quiet, I asked her if she was all right and she looked up and said yes and smiled. “I was in hospital for three days and Katy-Anne and John never left my side. We still talk at least once a week. “That was the whole point of Surrogacy UK – they wanted you to have a friendship. “I went up to see them and we went on a tour of Scotland together.” Katy-Anne says: “I don’t believe a normal baby handed to its mum and dad would be aware more than Grayson was aware John and I were his parents. “We arrived at hospital as three people and left as four. It is amazing that a young boy is here and is ours. “The Postcode Lottery funded the first two tries and Sarah’s expenses. Our final IVF attempt went on the credit card bill. Husband John, 33, a bank worker, said: “Everything feels like it should be and we have settled into family life. Any time Grayson does something new we try to take a picture of it so we don’t miss any moment. If you would like to share your surrogacy story, simply contact us using the Story Valuation form. You’ll find other ways to contact us here. We’re not just seeking your surrogacy story. We provide the world press with stories, photos and videos every single day. If you have any newsworthy story, photo or video, we want to hear from you. We cover every type of story, supplying up to 20% of all news content in the print press. See our Sell My Story to the media page for more information.